We took a tram. The gray concrete representation of Vincent van Gogh was our index. We alighted at the stop after. Buddy looked at her palm. Rolled her fingers into a circle, ‘My scroll of Mucha poster is missing’. Déjà vu, experiences of her losing things back at home had emptied me of surprise and anxiety. It was another drill, except in a different city. We looked for any street name that would suggest the next turn to take. After taking a number of wrong turns, the tall gabled houses swirled around me. My backpack weighed heavier as it threatened to pull me backwards and put me in a coffin position. I watched the opposite happening to Buddy, gravity pulled her shoulders and head towards it, forming an almost perfect seven. We stood in front of the ‘Lost and Found’ counter at the basement of the train station. ‘The lady at the information counter told us that she had sent the scroll of poster here’. My sight framed the high contrast between his white collar and his chin, a perfect picture. He turned to ask his two other colleagues. My eyes swept through the seemly-organised mass behind the shield-counter and a brown scroll caught my eyes, the resemblance was uncanny. Upon their replies, our glazes followed his to his hands fiddling the sheets of written documents on his desk, before looking up to direct at us, ‘If you are only looking for a poster, then no, we haven’t got your poster.’ I pointed to the brown scroll beside a small black bag and claimed that it was Buddy’s poster. ‘It came with the bag, so they are together. The bag is not yours. So they are not yours’, came the impatient reply of his cute colleague. Mucha in Buddy’s hand, on the steps of the escalator, wondering if they would rather have us claiming the black bag as well, we breathed, ‘Stupid Men’. Insulting the whole male population was instinctive. My temporal presence in this city urged me to capture all possible subjects with my frames. I would rather kill more negatives than to miss a possibly good picture. Defined clouds outlined in gold. I wonder if they look beautiful because I took the time to look at them or were they exceptional to this sky without obstruction from high-rise buildings. 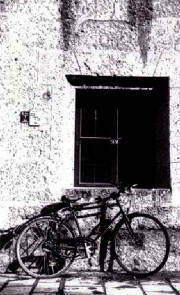 Black bicycle leaning against the red windowsill with pots of flowers, half naked man wrapped in white paper skirt, held together by strips of cream masking tape, reflection of buildings on the glass exterior of another building, elderly woman who seemed to age further with her longing-look, breast-like lamppost against the evening sky, every fountain with Greek-looking statues and the front of every museum too. All looked worthy of another shot. Buddy and I turned, this time it was two peddlers with their fruit. They grinned, waiting for our confirmation. I could not refrain myself again and I corrected, ‘Chinese, from Singapore! Ciao!’ As we quickened our steps out of dimly lit underpass, we wondered how long we have to wait before someone eventually says the word ‘Chinese’. The train was like a mini city with people from different walks of life, all packed in a space. Having their individual spaces yet sharing them. Each was preoccupied with their happenings that made up the city. Buddy and I had no worries till the end of the trip. Two nights of blind exploration in taking intuitive turns only left us impressed with the close proximity of the Metro stations. We were determined not to let history repeat itself for the third night. We prepared ourselves in the morning by identifying the different shops on our route from the hotel to the Metro station as our breadcrumbs. Coming out from the Metro station into the labyrinth, we took the first turn and walked against the traffic. Dim light did not prove to be helpful in locating my hair salon, red wine bar nor could Buddy find her Chinese restaurant and confectionary. All buildings looked identical under the starless evening.